Bone is living tissue, and this formula supplies key bone nutrients in their most bioactive forms. Ossein microcrystalline hydroxyapatite complex supplies organic calcium with natural bone growth factors. Vitamin C assists bone matrix formation. 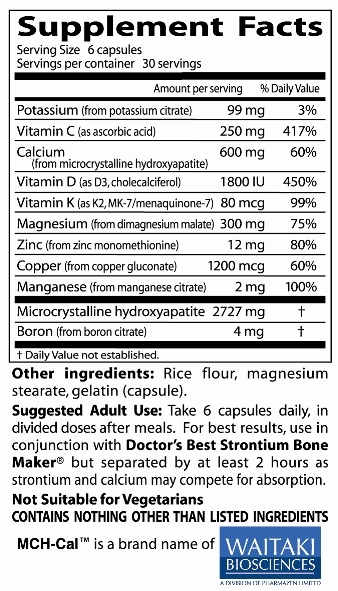 Vitamin and K are crucial to matrix calcification, along magnesium, potassium, zinc, copper, manganese, and boron. Calcium Bone Maker Complex represents the most advanced clinical understanding of bone health. Men as much as women need generally high blood vitamin D levels to maintain a high bone density11 that protects against falls and fractures.9-11 Yet among adults 65 and older, at least 40 percent aredeficient in vitamin D.12 Calcium Bone Maker® Complex supplies a generous 1800 IU’s of cholecalciferol, the most active form of vitamin D.
Long known as essential for clotting (K stands for Koagulation4), vitamin K is also essential for “guiding” calcium to where it belongs (the bones, teeth and other hard tissues), rather than to the soft tissues where calcium’s accumulation can cause serious harm.7 Just as vitamin K activates the clotting proteins, it is essential to activate several proteins that bind calcium into the forming bone.4 These include osteocalcin, matrix Gla protein, periostin, and others.4, 13 Low dietary vitamin K2 intakes are linked to abnormal calcification of the coronaries and other large arteries, the heart valves, the heart muscle, or the kidney tubules.14 By providing the most active K2 form (MK-7) at 80 micrograms per day, this formula ensures the necessity of vitamin K for healthy bone maintenance. Reid IR, Bolland MJ, Grey A. Osteoporos Int 2008;19:1119-1123. Bischoff-Ferrari HA, Dawson-Hughes B, Baron JA, others. Am J Clin Nutr 2007;86:1780-1790. Yaegashi Y, Onoda T, Tanno K, others. Eur J Epidemiol 2008;23:219-225. Kidd PM. Altern Med Rev 2010;15:199-122. Feng X. Curr Chem Biol 2009;3:189-196. Peterkofsky B. Am J Clin Nutr 1991;54:1135S–1140S. Bolland MJ, Avenell A, Baron JA, others. BMJ (Brit Med J) 2010;341:c3691 (Online First-9 pages). Russo D, Miranda I, Ruocco C, others. Kidney Int 2007;72:1255-1261. Dawson-Hughes B, Mithal A, Bonjour JP, others. Osteoporos Int 2010;21:1151-1154. Bischoff-Ferrari H. Dermatol Ther 2010;23:23-30. Bischoff-Ferrari HA, Kiel DP, Dawson-Hughes B, others. J Bone Miner Res 2009; 24:935-942. Barnard K, Colon-Emeric C. Am J Geriatr Pharmacother 2010;8:4-33. Berkner KL. Vitam Horm 2008;78:131-156. Beulens JW, Bots ML, Atsma F, others. Atherosclerosis 2009;203:489-493. Nishimuta M, Kodama N, Morikuni E, others. J Nutr Sci Vitaminol 2006;52:402-406. Standing Committee on the Scientific Evaluation of Dietary Reference Intakes, Food and Nutrition Board, Institute of Medicine. Washington, DC: National Academy Press; 1997. Killilea DW, Maier JAM. Magnes Res 2008;21:77-82. Strause L, Saltman P, Smith KT, others. J Nutr 1994;124:1060-64. Siegel RC, Piimeli SR, Martin GR. Biochemistry 1970;9:4486-4490. Leach RM, Muenster AM, Wein E. Arch Biochem Biophys 1969;133: 22-28. Hunt CD, Herbel JL, Nielsen FH. Am J Clin Nutr 1997;65:803-813. Tucker KL, Hannan MT, Chen H, others. Am J Clin Nutr 1999;69:727-736. Heaney RP, Dowell MS, Hale CA, Bendich A. J Am Coll Nutr 2003;22:142-146. Hunt CD, Johnson LK. Am J Clin Nutr 2007;86:1054-1063. Neilsen FH. Magnes Res 2004;17:197-210.